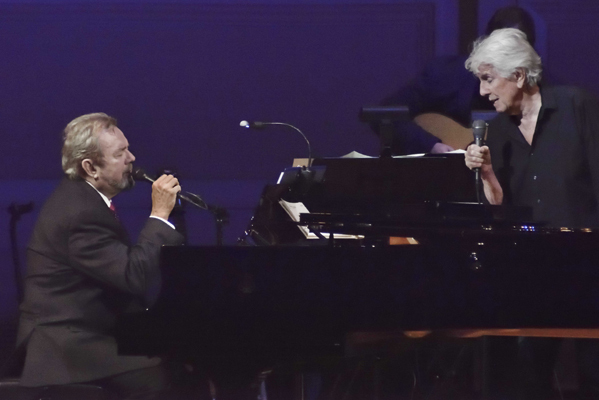 Legendary composer and lyricist Jimmy Webb had a well deserved tribute concert dubbed “The Cake And The Rain” at the highly prestigious and pristine sounding Carnegie Hall this past Wednesday evening. Proceeds go to the Alzheimer’s Association and I’ll Be Foundation, in behalf of Webb’s long time close friend and fellow songwriter Glen Campbell, who has unfortunately been stricken with the disease. Webb’s wife Laura Savini was the main organizer of this special event. An eclectic gathering of artists were in tow to honor Webb’s long, successful musical journey. The concert coincides with the recent release of Webb’s autobiography, also entitled “The Cake And The Rain.” Webb, 70, played piano along with many of the performers. They included, in random order, Judy Collins, Art Garfunkel, Johnny Rivers, Graham Nash, Marilyn McCoo & Billy Davis, B.J. Thomas, Dwight Yoakam, Hanson, Toby Keith, Amy Grant, Michael Feinstein and Catherine Zita-Jones. They each sang two or three songs. Actor Michael Douglas (husband of Catherine Zita-Jones) was the MC. Douglas and Webb were once roommates, hence their connection and long standing friendship. Glen Campell was referenced throughout the concert, with his daughter Ashley performing her father’s music as well. Webb has said that he became enamored with Campbell’s music in 1961, when Webb, then 14, first listened to Campbell’s “Turn Around, Look At Me” record. The two would be first introduced to each other when Campbell heard Johnny Rivers performing Webb’s “By The Time I Get To Phoenix” in 1965, helping to break Rivers. This is one of Webb’s earliest songs, and certainly one of his very best and most emotional. The song was instrumental in launching Webb’s career. Upon hearing the tune, Campbell loved it and thought he could have a hit with it, which he did in 1967. The song also won Campbell Best Contemporary Male Solo Vocal Performance and Best Pop Vocal in that year’s Grammy nominations. Soul singer and composer Isaac Hayes also fell for the track, and performed it as a nineteen minute opus with a then unheard of eight minute spoken intro on his debut solo record in 1969. Hayes slowed it down, brought his deep baritone voice to it and had himself a gorgeous hit as well. Most of the artists expressed what a thrill and honor it is to be on the stage of Carnegie Hall. Built in 1891 and holding 3,671 seats, it’s a dream come true for any performer to make it there. Especially known for it’s spectacular sound for classical music, the stellar group of backing musicians, including a small string section and female backing vocalists shined behind the performers. Every nuance resonated clearly and fully. Webb’s extensive catalog of famous songs are filled with rich, heart felt emotion and thought, and there’s no better place to hear them in all their glory. Congratulations, Mr. Webb. Tonight you deservedly had your big ‘ol cake and ate it too.